The online computer hardware and software store Newegg has posted the release date and US pricing of the highly anticipated Windows 10 operating system. Microsoft has not yet announced the release date of Windows 10, but there have been a number of slip-ups so far in regard to the imminent launch of this new Windows platform. 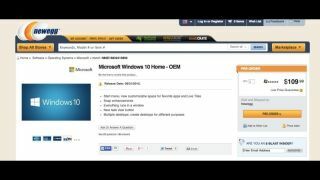 Newegg's website not only states that Microsoft Windows 10 Home will be available from the 31st of August, the site is also selling pre-orders of the software for US$109.99 (£72, AU $143.45). The Windows 10 Professional edition is listed under the same release date for US$149.99 (£98, AU$196). The Newegg appearance is slightly less vague than AMD CEO, Lisa Su's slip up in April, where she accidentally announced Windows 10 would arrive "at the end of July". But the head of the renowned PC semiconductor manufacturing company is someone you would expect to be aware of such precious information. Since Lisa Su's slip-up regarding the Windows 10 release, both The Verge and a russian leaker have claimed their sources inside Microsoft are confirming a late July Windows 10 launch.